A Lane County jury has assessed damages of $12.2 million against a hospital system and doctors after they caused severe brain damage to a father of five by administering 18 times the prescribed dose of a heart medication. Lee Lyman, 56, of Springfield, was the victim of a drug medication error “of a magnitude never seen before” involving amiodarone, a high-alert drug used to restore normal heart rhythm, said his court-appointed Conservator, Sam Friedenberg, of Portland, about the award handed down Oct. 19. “This was a catastrophic error that began in the hospital pharmacy and ended in the surgical suite with devastating injury to a patient. It is the kind of error that research has shown has claimed the lives of thousands of hospital patients every year,” he said. Evidence in the three-week trial showed that a PeaceHealth anesthesiologist at Sacred Heart Medical Center at Riverbend in Springfield, OR, administered 2,700 milligrams instead of the 150 milligrams of amiodarone ordered by the surgeon after Mr. Lyman’s heart beat became unstable following surgery on March 2, 2011. “As a result of the overdose of medication, Mr. Lyman’s heart stopped sending adequate blood and oxygen to his brain, resulting in catastrophic brain damage. Mr. Lyman, who was a local factory worker, avid outdoorsman, and father of five children, has lost much of his ability to function and will require extensive medical care for the rest of his life,” according to Eugene attorney Don Corson, who represented Mr. Lyman at trial. According to court testimony, the anesthesiologist misinterpreted the number “50” on the hospital computer screen to mean he should retrieve three 50-milligram bottles of amiodarone from the hospital’s automatic dispensing machine, to equal the 150 milligrams ordered by the surgeon. Instead, the hospital had stocked the machine with 900 milligram bottles, and the anesthesiologist, who was administering the drug for the first time, pulled three of the big bottles, for a total of 2,700 milligrams. 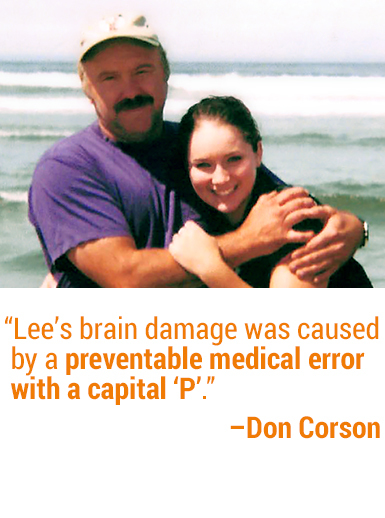 “This was preventable medical error with a capital ‘P’,” Corson said. The jury found both PeaceHealth and its anesthesiologists negligent and liable for the extensive harm to Mr. Lyman. His approved life care plan will make sure the money will take care of his needs for the rest of his life, Corson said. “Hospital standards call for hospital pharmacies to stock operating rooms with single-unit doses of medications, especially high-alert, emergency drugs, so that doctors don’t have to stop and measure out the correct amount. A 900-milligram bottle of amiodarone should never have left the hospital pharmacy,” Corson said. This entry was posted in Catastrophic Injury. Bookmark the permalink.